Besides, it is already written that the human creatures that were formed from test-tube experiments were NOT to be given long lives or "eternal" lives. I'm just curious. Where is this written? Back on topic. Adam and Eve's mortality? I don't know. If "Adam and Eve" are defined as the ancestors of all humans, then from an evolutionary standpoint they would have lived probably a few million years ago. And we know for a fact they were created mortal. You do not have an original source. At best you have copies of copies. You may have an "official" oral tradition which boils down to no less than one man's opinion passed down, the Catholics have this too. The text as it stands may have some word/phrase errors but I seriously doubt you have intimate knowledge of ancient Hebrew and will rely on some explanation proffered by someone else. Even at 95% accurate, it stands as is for discussion. None of us other than perhaps Whoppers here are linguist scholars. The story is mythical no matter what type of spin you try place on it. The dateline Jews and xians use are not that dissimilar and is approx 6 thousand years ago. To believe this is in anyway truth™ one has to ignore tons of archaeological evidence found in many parts of the world of ancient man that pre date the bible by thousands if not tens of thousands of years. We have plenty here in Africa. The age of the planet is now scientifically proven to be in the order of 4.5-4.7Bn years old. No one in their right mind would assume folk 2500 years ago had more scientific acumen than what exists today. A 12 year old today has more scientific knowledge than the ancient scribes and priests of yore had, this is called progression. Current knowledge in genetics shows us siblings cannot mate and expect perfect offspring. We are told by apologists, the DNA (only a recent scientific discovery relatively speaking) back then was pure and as such marriage between A&E offspring is how it happened. Science has refuted the genesis account in its entirety and all that the religious folk are doing is doing mental gymnastics to try and retain relevance to their archaic belief system. This is where it all "started" religiously speaking. Science shows however it started waaaaaaaaaaaay before this and differently. A rational person knows magic is merely an illusion. The big question "Where did we come from?" Religionists do not have the right answer and boils down to no more than the "stork theory" one shares with toddlers should they ask a question that requires a complex answer. Scientists are still trying to answer that question and have far more plausible proof on their side than the religionists do. The difference, the scientific explanation has no baggage and does not simply expect you to "take our word for it" aka faith in the answers presented thus far. If science finds errors, it is self correcting. The same cannot be said for the other side. The topic of immortality of the originals under scrutiny here sets the whole stage for your religion and the xian one as to the equally mythical hereafter. Can science refute and/or prove that aspect? No. Science deals with reality and not mythical constructs or the imagination of men. Try reading some of my posts again, where I discuss Genesis 1-3, and the many other posts of other members that make reference to Genesis. If I post the contents of the text in English, it is because we are on an English forum. If your transliterations of the original Hebrew names are any indication of the Hebrew text you are using, it might be time to find a better Hebrew text, or a better transliteration system. The ORIGINAL Biblical Hebrew didn't have "v"s in the language (a more modern pronounciation) and you missed a dagesh forte (doubling the waw), and the vowel "o" does not appear in the ORIGINAL name of either the PN for Adam or the common term for humanity, adam. If you want people to go back to the original Hebrew, then by all means - go back to it. But don't use modern Hebrew, instead - and bad modern Hebrew, at that. As you can see - some of us do have access to some forms of the "original" text (whatever one considers that to be). I deliberately chose a translation in my posts (the Schocken Bible) that would be closer to the Hebrew than normal translations usually are. Is this another post of yours (as usual) pointing out that non-Hebrew readers have no right commenting on such matters? Only orthodox jews again? If you're so concerned about what the original text says (which many of us have been commenting on) - then why haven't you added your two cents worth, rather than constantly slinging arrows at the participants of this thread? I still have YET to see you ontopic with a comment concerning their mortality. Based on your interpretation of scripture, do you believe that Adam and Eve were created from the beginning (before the fall) as (physically) mortal or immortal beings? Please explain your response and back it up with scripture if you can. Are allegorical people mortal or immortal? I still interpret the Adam and Eve story as simply a way of saying "ignorance is bliss", but sentience is better even with the consequences that come along with it. I doubt it was intended to be considered as a literal story even thousands of years ago, and you'd have to be quite small-minded to think it really happened, especially if you get hung up on adam and eve as actual people instead of missing the whole (still valid and profound) point of the story to begin with. I've always preferred that interpretation as well. Consciousness brings with it morals and taboos, ideas of right and wrong, and with this knowledge, responsibility for one's own actions. 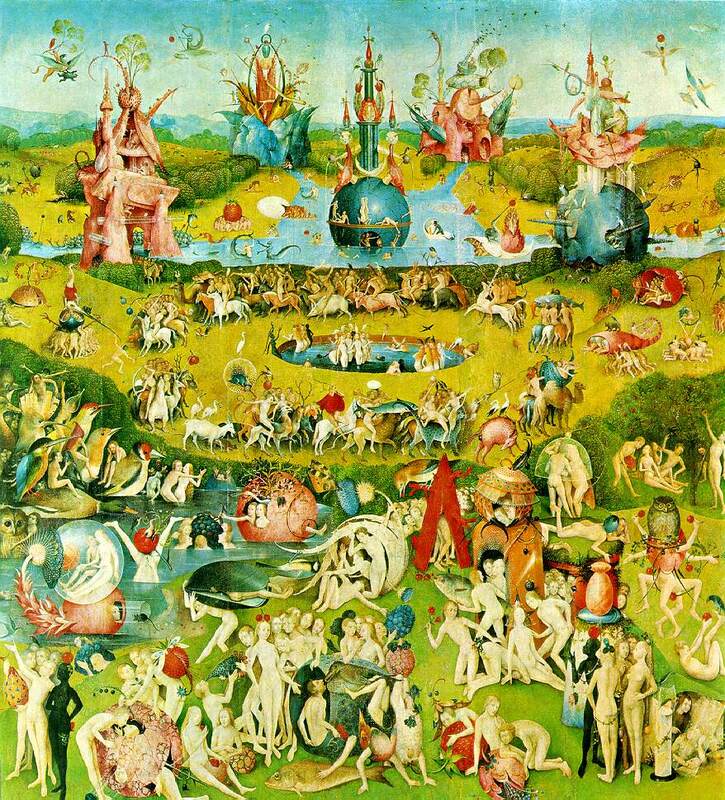 We can no longer innocently live in Bosch's Garden of Earthly Delights painting. Animals may still proceed to slaughter one another for food - fox kills momma rabbit, and it's okay. ; for they have not "eaten from the tree of the knowledge of good and bad". Us humans, on the other hand, we are now open to punishment for our actions. What I am proposing is very simple. In fact, it is so simple, I am quite surprised that no one, to my knowledge, has presented this view on paper before. After discussing it with Rabbis, Hebrew professors, etc., I wonder why a scholarly discussion and paper has not been rendered. It will not surprise me if later it is discovered that someone has already exhausted this view, only to capitulate the position in [their] conclusion, as many scholars do on many other issues. Nevertheless, until I actually see the unknown or unfound previous work, I feel compelled to present this paper for the consideration of those with an open mind, or even just ears to hear. The mechanics of the Hebrew in this case should not be a problem. One without a knowledge of the English language, if presented with a English word written on paper, should, if shown multiple copies of the word made on a photocopy machine, be able to identify all copies of the word as being precisely and exactly the same identical word. Since it is evident that this can easily be done, even without a knowledge of the English language, likewise, a knowledge of Hebrew should not be necessary for one to see that the same word in Hebrew is translated correctly into either the third person masculine singular, or the first person collective plural. This happens not only in Scriptures far removed form the book of Genesis, and in different chapters in the book of Genesis, but also in verses very near, and in the same context, within the same narrative. "... the man has become like him, to know good and evil; ..."
It may appear startling that no translation into English has done this verse the justice it deserves. But this is fact. First, the particular suffix found here on the Hebrew word "Min" (#4480 in Strong's Hebrew) can be translated with equal correctness into the first person collective plural, or the third person masculine singular. Either "like us," or "like him." Second, the context of the sentence determines which is correct; "him," or "us." Please see this rule of Hebrew grammar on the following pages [not available here, but copies can be obtained from the address below]. Third, who did the man become like after he sinned? The man became like the one who tempted him and his wife. He became like "him," the adversary, to know both good and evil He already knew good.After he sinned, he then knew evil. The Hebrew text literally says the man "is become like one of his," or, "like him." When man sins, he does not become like Yahweh, or like the Messiah. When man sins, he becomes more like "the evil one." This is what the context of the Scripture teaches. The translators have played "follow the leader." They have ignored a very worthy, and much more probable and correct translation of Yahweh's word in Genesis 3:22. This challenges every known every known English version of the Scriptures, but it is a true and correct translation. I challenge everyone to dig into this to see if it is so. Additional copies may be obtained from the author, or from the address below, or you may make your own photocopies [or copy this]. I always understood immortal, although I assumed they would reproduce? Or were they to be the only human beings ever? haha. Then in what sense did they 'die' when they ate the fruit? I would think Adam and Eve were created potentially immortal, but due to certain factors of their choice the potential has not been fully realized yet. In other words I think mortality is temporary. I believe this life is not all the life there is.